When Sinn Fein collapsed the Stormont executive in early 2017 they put forward a very simple case. The Irish peace process was based on legal documents and international treaties and on a series of agreements and promises that had constantly been broken. If the process and the institutions were to survive it was time to live up to the existing agreements before moving on. This involved resolving state killings, reducing sectarian provocations, and accepting a level of gay rights such as gay marriage and an Irish Language Act. They also argued that the Democratic Unionist Party leader, Arlene Foster, was so deeply immersed in a £500 million “cash for ash” green energy scam that she should step aside. No-one accepted this idealist position. The Irish government, the British, the political parties, the trade unions, civic society and the media all defined the problem as a “disagreement” between Sinn Fein and the DUP. The provisions of the Good Friday and St Andrews agreements were immediately torn up by the British to prevent total collapse and the area administered through an Alice in Wonderland mechanism PeaCE PR where whatever the British secretary of state said was so. Minimal administration and budget measures kept local health and social services on a knife-edge, sharpening trade union support for a deal and squeezing the poor and more deprived, many of whom were Sinn Fein supporters. The solution would be not to enforce anything, but to negotiate another fudge that would move the process further to the right. The narrative of disagreement hides the catastrophic decay of the Irish peace process – a decay also reaching into Irish and British political structures. In the rubble there are appeals to the legal structures of the process, but all that is left are the bare bones of power – with British support for unionism providing a touchstone for the next chapter. Sinn Fein did not even agree with itself. Before the breakdown they had collaborated in deal after deal and, after a year of exile, joined February talks based on a new set of concessions. So if there are no laws, agreements, policies, acting as mechanisms to operate the political process in the North of Ireland how does it operate? The overwhelming factor in the governance of the North of Ireland is the interests of British imperialism. When Stormont is in operation the British remain in the shadows. When it collapses they call the shots and set the terms for a revival. The mechanism for the expression of their interests is their mass unionist base. A big problem for the British is that this base is not very pliable. When DUP leader Arlene Foster began backing away from an agreement she said that it must include everyone. She meant that literally. All of unionism has to be won over, down to the last Orange bigot. If they split they no longer have a majority and a Sinn Fein administration would lead to a unionist uprising and the collapse of the whole house of cards. Subordinate to the British are the interests of Irish capital. Their interest is to keep good relations with the British, preserve the partitioned settlement, represent middle class nationalists and the Catholic Church interest in the North, and apply muscle to Sinn Fein to nudge them towards the latest concession. They have also to keep one eye on workers in the South, who remain attached to the goal of a united Ireland. The arrival of Brexit has put these conflicting interests under strain. 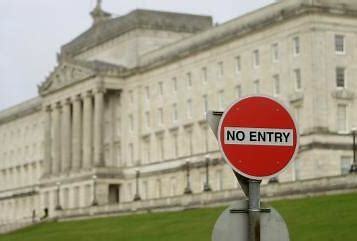 The main mechanism holding up the current settlement is Sinn Fein itself. Military and political defeat led to a switch from revolutionary nationalism to constitutional and pro-capitalist politics. They have managed to hold onto the majority of their working class base while representing the interests of a complacent nationalist business class who have gained a great deal from the settlement. They have also gained a base in the 26 county state and are anxious to prove themselves a responsible capitalist party, worthy of inclusion in the next coalition government in Dublin. The frequent crises in the north are resolved by kicking Sinn Fein and moving the process further to the right in order to conciliate unionism. It is also important to bear in mind that relations between Sinn Fein and the DUP, despite all the claims and popular belief, are not equal. Sinn Fein has no plan B and draw a lot of their resources and patronage from the continuation of Stormont. The DUP are much less dependent on these resources, are deeply embedded in the state apparatus, have the support of the British and, since the last election, have demanded over and over again that the British bring in direct rule rather than agree any significant concessions to nationalism. The DUP pact to help keep the May government in power is simply icing on the cake. In these circumstances it is hardly surprising that Sinn Fein was forced into yet another climb down. Their calls on the British and Irish governments to play fair and obey the rules had fallen on deaf ears. The northern settlement was decaying and, like a gambler betting all or nothing, they pushed for a strategic of being in government in both Belfast and in a Dublin coalition. So they got next to nothing – in some cases less than nothing. Even if the deal had gone ahead it was based on the same fudging process as past deals and, as before, would have led to further chaos and collapse. Amidst the shouting and accusations there is actually a high level of agreement about the outcome of a new deal. Arlene Foster would stay as First Minister, despite an ongoing enquiry demonstrating her overall responsibility for a £500 million “Cash for Ash” scam. All of Sinn Fein’s red lines, gay marriage, modification of the sectarian veto on majority votes in the Stormont assembly known as the “petition of concern” were kicked down the road yet again. The British promised in a side deal that they would provide money to fund inquests into state killings. Sinn Fein agreed to a further strengthening of unionism by making it more difficult for their withdrawal from the executive to collapse the executive. The return of the assembly would have meant the implementation of the “Fresh Start” austerity deal agreed by the parties before the 2016 collapse that would have seen savage cuts and a mass transfer of funds from the public sector to a privatization agenda. At the heart of the new agreement was a three-strand “language and culture” bill with acts that would combine to make a final single bill. Yet again Sinn Fein genuflected to an imaginary “Ulster Scots” language, legitimising the dialect and “Orange culture” in a naked capitulation to sectarian supremacy. In return they asked for the chance to claim that an Irish Language Act stood alone as a single concession. Later Arlene Foster attempted to reassure her base by listing all the things this act would not contain – it would have had no public presence and in essence it would have been invisible. And this was the history of all the revisions of the Good Friday writ large – absolute capitulation by Sinn Fein in return for a fig leaf to convince there supporters that they were making progress. 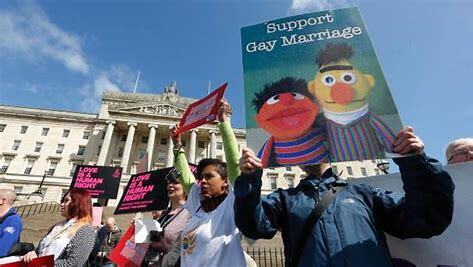 In this case the claims of progress were based on slight of hand – a legal separation of the Irish Language Bill to allow them to tell their supporters that it is a standalone measure granted as a right rather than designed to placate bigots. Let us be clear. For Sinn Fein supporters and nationalists generally a “standalone” Irish Language Act had a political meaning. It meant that recognition of the language was an inherent part of the “equality of the two traditions” promised in the Good Friday agreement. Sinn Fein had substituted a legalistic meaning – that a separate bill would exist before being fused with other elements into an act. Instead of asserting a right they had proposed a squalid deal. In fact Sinn Fein care nothing about Irish. Decades ago Sinn Fein supporters agreed bilingual signs in the local university students union. A furious unionist reaction led to the signs being removed and extra money for the Irish language society. Following the St Andrews agreement complaints about the absence of action on Irish were silenced by a £20 million bung to Sinn Fein to spend on the language. So why the catastrophic failure? The DUP leadership had settled and Theresa May and Leo Varadkar invited to witness it. They then claimed that no final deal had been agreed and that May and Varadkar were just on an informal visit. What had happened is that details of the agreement led to a surge of unionist bigotry. DUP leader Arlene Foster backpedaled and said there was no deal yet and there would be no significant concessions. The bigoted roar increased and she said that a deal was months away. She then consulted leadership figures in the party who told her that any sign of concession would be political suicide. Foster then announced that there would be no agreement and called on the British to institute direct rule. Unionism is essentially anti-democratic. Defining themselves as not Irish and as the Irish language as inferior is a default setting for the unionist right wing. The DUP were taken aback when the last assembly election appeared to hold out the possibility of a nationalist majority in Stormont. The subsequent Westminster election was fought in unity with loyalist paramilitaries around mobilising a sectarian vote. The programme was that the local assembly should be scrapped if it threatened the union with Britain. Since then the default position has been that direct rule represents the best way to head off a nationalist majority and a united Ireland. So a revival is unlikely. The DUP has utterly ruled out any significant concession on language and it is hard to see how Sinn Fein could survive further capitulation. The Good Friday peace process has collapsed. The battle has now moved into post process arrangements. The DUP demand full-scale Westminster rule. Sinn Fein demand the return of the assembly and oversight by a British-Irish intergovernmental council. Neither will succeed. When Britain wanted to disarm and disband republicanism and realized how strongly Irish capitalism supported them it applied the prod of a Dublin advisory body to force the unionists to accept the process. They now know how fragile their unionist base is and Sinn Fein, as a constitutional nationalist party, have no leverage. On the other hand, the removal of devolution would leave Britain under immense pressure to advance its own proposals for governance. It has already been asked to pass an equal marriage act. If it agreed this would it, for example, introduce an Irish language act? Much better to continue direct rule lite. There is no political opposition or alternative programme other than pressure on Sinn Fein to do more and pray that the loyalist reactionaries can be conciliated. The British have a free hand for now. The Irish question has now merged with the Brexit struggle. It is now clear that Sinn Fein desperation was partly based on new alliances in Dublin. The Irish government has realized that the endless assurances by perfidious Albion are worthless, see the Good Friday agreement and a functioning Stormont assembly as an obstacle to hard Brexit and pushed hard to get Sinn Fein ministers into office. For their part the British Tory right and the unionist element in the British Labour Party are now claiming that the Good Friday agreement is obsolete and should be torn up to aid Brexit. When the Good Friday Agreement was signed one local writer, asked what the new Northern Ireland reminded him of, replied that it looked mostly like the old Northern Ireland. Now, with the collapse of Good Friday, hard Brexit, the likelihood of border checks and Unionist ascendancy in the North, we can see what he meant. However we have had decades of Irish politics, and a significant section of British left politics, based on the assumption that the national question in Ireland had been resolved. It is now held so firmly that Sinn Fein, once a revolutionary nationalist movement, now calls on the British to save devolution in the North and responds to Brexit with calls for “special status” for Northern Ireland rather than call for an end to partition. Yet the assumption of change has proved false. The lure of constitutional nationalism and of lukewarm left reformism is now on the wane. A new chapter will see a renewed audience for the revolutionary perspective based around British withdrawal and a workers republic. “This year, as many know, Gay Pride was in Huddersfield to protest the police action against the local gay club [the Gemini]. One of the things that we took away from the event is the substantial opposition within today’s gay movement to class and socialist politics. That issue was made clear by the demonstration itself—ahead of which the owner of the Gemini club -John Pettigrew – drove his Rolls Royce. Later, when organizers met to discuss future strategy and the point was made that we [Gay Rights at Work] opposed what had happened—that John Pettigrew’s Rolls Royce should serve as a kind of flagship of our gay pride march—that person is shouted down and doesn’t get a hearing. National Co-ordinatior of Gay Rights at Work speech given in 1981. If the first minister happens to be gay like the former Secretary of State. Peter Mandelson, it is does not mean that the established and embedded reactionaries will not be supported. Similarly, in the south, no matter how much the current Taoiseach would like to wear his identity as a badge of modernity that will not change the consequence of the class politics of his government and the rest are pursuing. Now that the DUP have obtained a much better power sharing arrangement with Conservatives at Westminster – Stormont is simply the stage on which to defeat and humiliate, not only SF—but ALL opposition and now even those who desperately want to be or remain their friends. So that’s why the DUP leader was keen to say that progress had been made in burying the Belfast Agreement. It only remains for the right of the Tory party to follow the right of the Labour Party to enable the DUP to give the Agreement the last rites. Interesting, well researched article about the impasse re Ireland’s north/ south border, Brexit and Stormont.